1. Composition Competition – in association with Birmingham Conservatoire. Children are invited to create their own musical responses to Shakespeare in any musical style or genre. The Birmingham Conservatoire has developed resources to help schools with their musical masterpieces. Five winning entries will be chosen to work with the composer Daniel Galbreath and will have the opportunity to perform a specially arranged version of their composition alongside musicians from Birmingham Conservatoire at a Celebration Concert in June. 2. Exploring Shakespeare’s Music – in association with ABRSM. Through using this resource children have the chance to explore music in Shakespeare’s Day – who it was performed by, what was performed and where. Children are also introduced to some of the instruments that would have been used in performances of Shakespeare’s plays both at the Globe and at the royal court. A further resource encourages the children to compare and contrast two extracts of music, based on Romeo and Juliet, by Prokofiev and Bernstein. 3. Shakespeare Rocks! – in association with Musicline. Our partners Musicline have provided us with the vocal tracks, backing tracks and lyrics for three songs: Will’s Wonderful Words, No Girls Allowed and Shakespeare Rocks (an exclusive composition for Shakespeare Week 2017). Through learning these catchy tunes children will discover more about the bard himself and well and truly rock out with Shakespeare! Tudor music was made with materials easily available, and instrumental music particularly had an opportunistic element to it; making the best of what was at hand. Give your children the opportunity to create their own instruments from recycled materials and have a go at exploring rhythm and sound with some simple tunes. Teach your children three fabulous songs based on Shakespeare’s works: You Spotted Snakes, When That I Was A Little Tiny Boy and Orpheus And His Lute. The resources provide a range of warm-up games and exercises to prepare the children for a performance and include the musical scores and backing tracks. 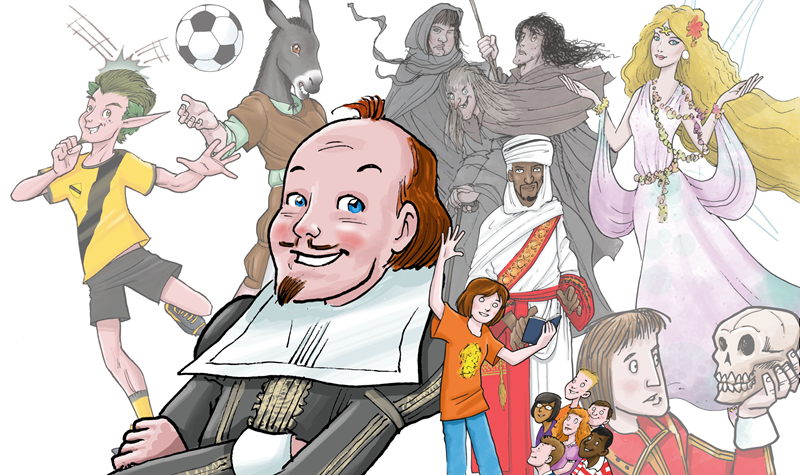 Mission Shakespeare is a series of age-appropriate online challenges for primary school aged children. These cross-curricular challenges engage children in active learning enabling them to earn digital badges for their creations! There are a number of musical challenges, including one prepared by The Sonnet Man himself, Devon Glover, where children perform Shakespeare hip-shop style! The world's leading charity in promoting Shakespeare's works, life and times. We care for the five Shakespeare family homes in Stratford-upon-Avon and are a leading centre for learning and internationally renowned Collections.